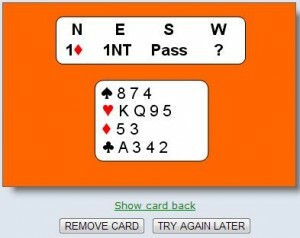 Bridge flash cards are a fun and easy way to practice bridge bidding topics and help you to learn to play bridge online. Each card has just one question on front. You can take as long as you need to work out your answer. Then you look on the back of the card to see if you were correct. The easiest to use flash cards are online ones. You can’t put them in a drawer and lose them. You will find hundreds of cards on a wide range of topics, all indexed and graded at No Fear Bridge. There are Acol bridge bidding flash cards on No Fear Bridge UK. You start by choosing the topic (or topics) that you want to work on, and the number of flash cards you want to use. 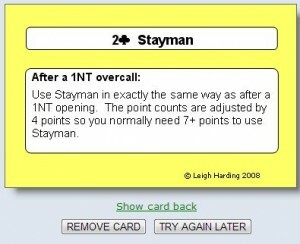 For this article, I’ve chosen 10 cards on the topic of Stayman bidding. The front of the bridge bidding flash card has the question for you to answer. 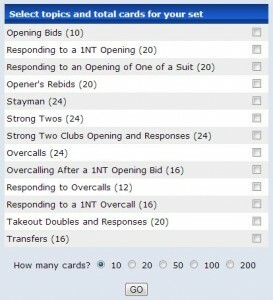 You can remove cards from the set when you get the correct answer and retain the ones that you need to work on again. When you can answer all the questions confidently and correctly you simply choose a new set of cards to work on. So – what are you waiting for. Join today and start improving your bridge bidding.